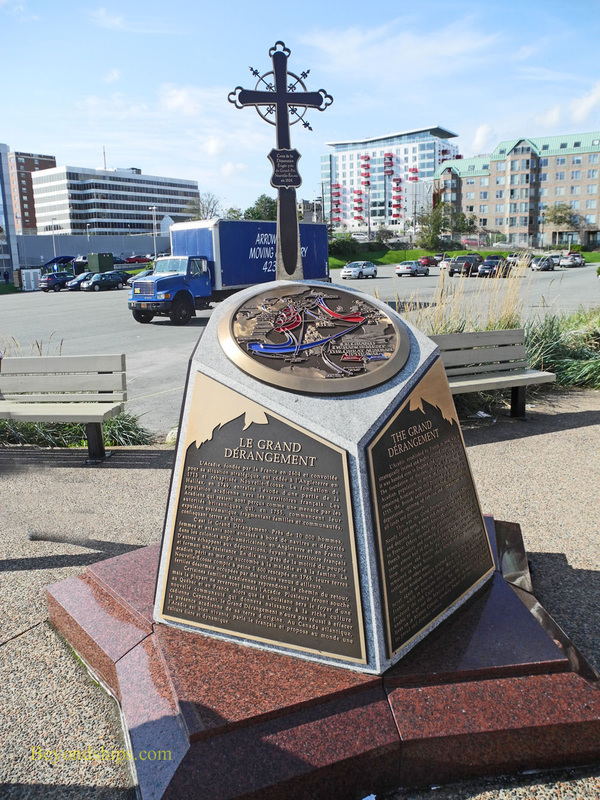 Above: A monument to the French Acadian settlers who were deported from Nova Scotia in the 18th century. 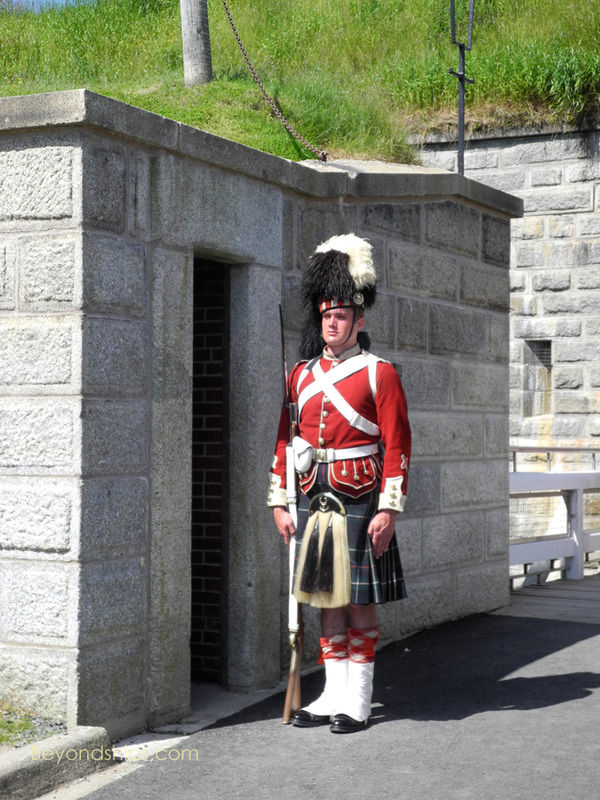 Below: A reenactor dressed in the uniform of a Highland regiment guards the Halifax Citadel. around 1000 A.D. but did not settle here. Similarly, John Cabot explored the area in 1497 but did not stay. The first Europeans to come and stay were the French who established a settlement in 1605. The English arrived shortly thereafter and for more than a century, France and England vied for control. The issue was settled in 1713, when in the Treaty of Utrecht, France conceded the area to Britain. The British named the area Nova Scotia, which is Latin for New Scotland. This was a fortuitous choice as the Scots would play an important role in the new territory’s history. Indeed, the ties between Nova Scotia and Scotland remain strong and it is not unusual to hear bagpipes or see a display of Highland dancing in Halifax today. settlers. However, the complexion of the area’s population changed substantially over the years, largely due to strife in other parts of the world. in which Britain and France struggled for control of Quebec, the French Acadians in Nova Scotia were deported to Virginia and Louisiana. (Their descendents became known as Cajuns). Independence, American colonists who had remained loyal to the British Crown sought a new home in Canada. Many settled in Nova Scotia. Highland clans against the British Crown led to harsh laws being imposed on the highlanders. What better place for a Scot to seek refuge than in New Scotland? Halifax has a fine, deep, natural harbor. As a result during the 19th century, it became an important transshipment port for goods arriving by rail from the interior of Canada. For the same reason, it acted as a point of entry for immigrants coming from Europe and then taking the trains to the inland provinces. Samuel Cunard was born in Halifax and went on to create a shipping empire based in Halifax. However, he is better known for starting the first regularly-scheduled transatlantic passenger service. His company, Cunard Line, continues to provide that service today. After the sinking of the Titanic in 1912, Halifax acted as the base for the recovery effort. As a result, a large number of Titanic passengers are buried in Halifax and a significant collection of Titanic artifacts is housed in the Maritime Museum of the Atlantic. During both World Wars, Halifax played an important role as a base for assembling convoys to cross the Atlantic and for anti-submarine operations. In the First World War, a collision between two ships waiting to become part of a convoy caused the most powerful man-made explosion until the atomic bomb. It devastated a large section of the city. The port remains an active naval base. 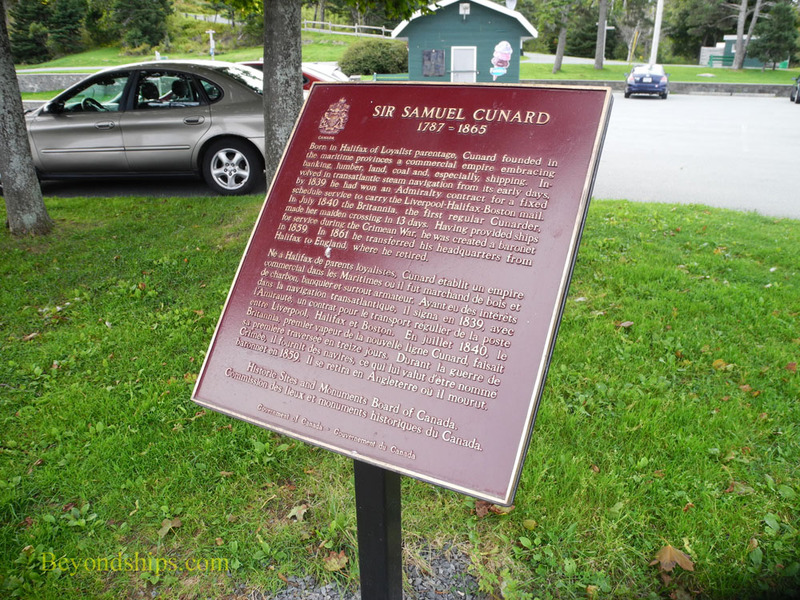 Above: A plaque in Point Pleasant Park recalling the contribution of Sir Samuel Cunard. 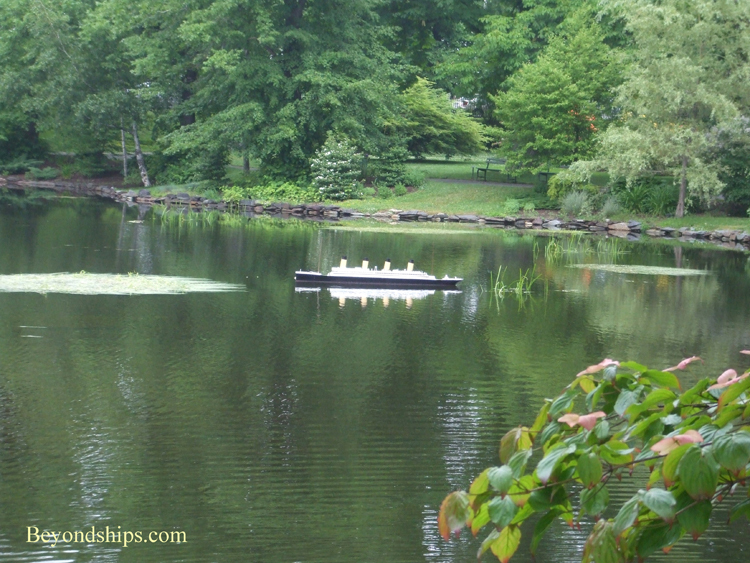 Below: A model of the Titanic sails a pond in the Halifax Public Gardens. 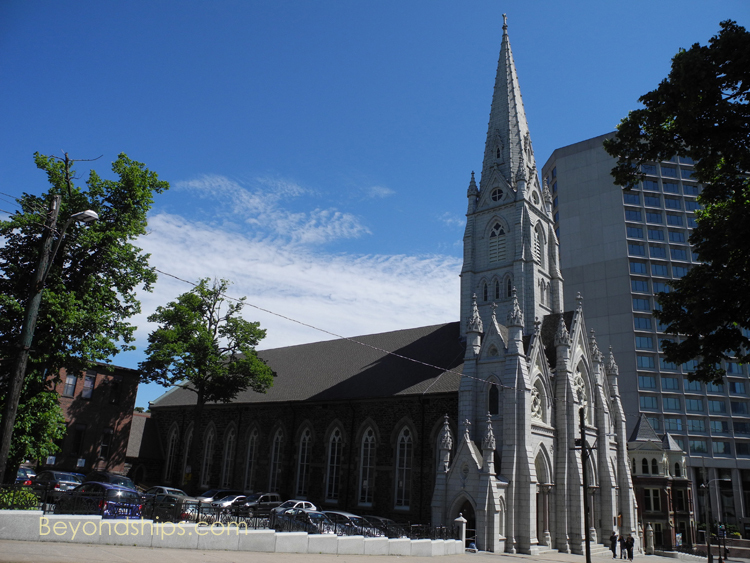 the tallest polished granite spire in North America.